On the 9th of September, 1943 the Allies land on Salerno. Summary: An invasion led by the British and American forces in which the would first take Sicily and all the way up to Rome. 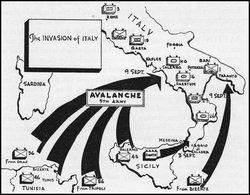 View Allied invasion of Italy and over 3,000,000 other topics on Qwiki.